Australia’s preventive health agenda is in serious trouble – it’s no exaggeration that at the rate things are going there’s a grave risk of it disappearing altogether. The government it seems is in favour of neither prevention nor cure – not so quietly ripping a projected $2 billion dollars from the health system, and that’s before we’ve forgotten, or even recovered from last year’s savage cuts. To leave us in no doubt as to the government’s lack of enthusiasm for preventive health, its first acts on taking office were to dismember the previous government’s Australian National Preventive Health Agency, kick the Alcohol and Other Drugs Council of Australia (ADCA) swiftly to the curb and remove nearly $400 million in funding for prevention to the states. The government’s latest 2015 budget cuts impact heavily on preventive health research and chronic disease prevention. And this is all playing out just ten short years from Australia’s goal to reduce chronic disease (non-communicable disease) by 25 per cent by 2025 in line with the World Health Organization’s targets; a plan our nation endorsed and fully committed to back in 2011. Chronic disease has been described by the Australian Institute of Health and Welfare as our country’s greatest health challenge. That’s not an exaggerated claim designed to get your attention, but rather a statement of fact, albeit a very alarming one. Chronic diseases including heart disease, stroke and heart failure, chronic kidney disease, lung disease and type-2 diabetes, are together responsible for 90 per cent of all deaths in Australia. That is nine out of every 10 deaths. As you could well imagine, this places a great economic burden on Australia’s health system. Today Australians are living longer, and that too presents an ever greater challenge for our health system because we are also living longer with chronic diseases. The World Health Organization recognises the enormity of the threat posed by these diseases, but for Australia, success in this area requires more than a signature on a framework. Chronic disease is driven largely by lifestyle factors such as physical activity, diet, tobacco and alcohol consumption and by the tobacco, alcohol and junk food and drink industries. And these lifestyle factors can all be positively addressed and influenced, just as we can sensibly regulate the harmful effects of these industries. Any serious efforts to successfully reduce the burden of chronic disease requires a commitment and determination to preventive health from our political representatives. And where we have been successful, and global leaders, is when we have long term bipartisan approaches – such as tobacco control and AIDS. A national commitment is sadly lacking. Australia’s investment in prevention is pitiful with only 1.7 per cent of total healthcare spending allocated to public health. Canada manages 5.9 per cent and NZ is the leader, on 7 per cent. This must change is we are serious about stopping disease before it starts. In late July more than 1,000 delegates will descend on the Australian Labor Party’s (ALP) National Conference in Melbourne. They will come together to vote on the ALP’s National Platform, which will set out the party’s broad agenda heading into the next election. While the government may well be the ‘party of wealth’, Labor has long laid claim to being the ‘party of health’. It does so with some justification – Labor created both Medicare and the Pharmaceutical Benefits Scheme. When Labor was last in power I chaired the National Preventative Health Taskforce. We proposed a ten year roadmap: a detailed target driven blueprint for tackling the burden of chronic disease currently caused by obesity, tobacco, and alcohol. On tobacco, Labor and now the current government have made significant headway. Plain packaging and increases in the price of tobacco through higher taxes made Australia a world leader in tobacco control and Nicola Roxon a leader of the public health movement. As a result of this bold leadership, the incidence of smoking in Australia continues to decline and is at historic lows. While the Australian National Preventive Health Agency met with less success, dismantled by the incoming Government before it could even get going, the creation of such an agency stands as a testament to Labor’s commitment to preventive health, and the need to invest if we wish to save lives and money in future years. Which is why the current framing of Labor’s position on chronic disease in its Draft Platform is disappointing. It fails to acknowledge the importance of global action on chronic disease and how critical it is that Australia meets its committed goals for 2025. More troubling, the Draft Platform contains no reference or commitment to the work already undertaken; the aforementioned National Preventative Health Taskforce roadmap on chronic disease. Valuable work has already been done; now we just need to get to work. 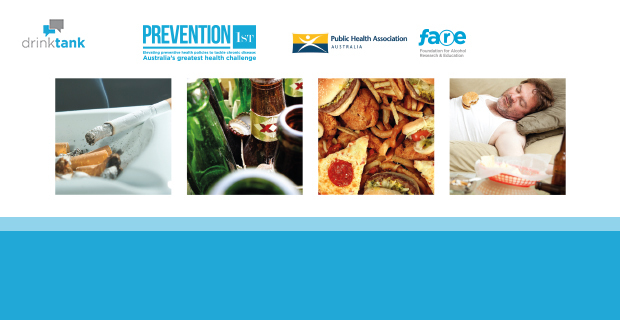 The Government and the Labor Party may have forgotten about preventive health but we have not. Today, the Mitchell Institute has released a blueprint for preventive action on chronic disease in which looks at what can and should be done to improve population health and prevent illness and argues that we require concerted and consistent efforts and action to address chronic disease in Australia. Public health organisations concerned about chronic disease and the absence of a strong commitment to preventive health efforts by both the Government and the Labor Party are working together to urge both parties to rethink their direction. We will turn our attention first to the Labor Party’s National Conference in late July. We will be watching closely to see whether Labor will build on its legacy and ensure that it remains the party of health. To do so, it must make tackling chronic disease its number one health priority and adopt a clear prescription for combatting chronic disease that puts Prevention First. An edited version of this post was first published in The Age as Chronic lack of healthcare funding leaves both parties looking sick on 4 June, 2015. Well done, Drink Tank, for highlighting the Mitchell report. I’m part way through reading the report & I’m impressed – evidence-based, good discussion of behavioural change science, good data on economic & human costs of failing to act, & good myth-busting. The more people read the Mitchell report – & lobby accordingly – the better.